DENVER (AP) Gary Harris had just enough time to catch the ball and shoot – and his aim was true. 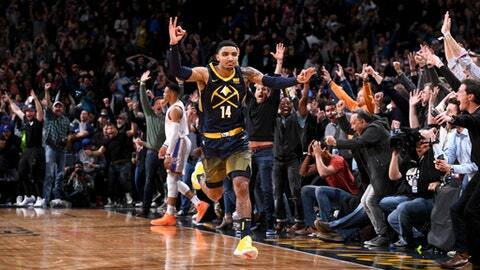 Jamal Murray had 33 points to lead the Nuggets, who had lost their previous two games by a total of three points when they missed last-second shots. Paul George had a season-high 43 points to lead the Thunder. Westbrook had 21 assists, one shy of his career high, to go with 20 points and nine rebounds. Trailing by 15 at the half, the Thunder pulled within nine points at 76-67 on a jumper by George, but the Nuggets put together a 12-5 burst that included 3-pointers by Harris and Murray to go back in front by 15 points. They held a 104-89 lead into the fourth quarter. The Thunder narrowed the deficit to six on a driving layup by George with 4:40 remaining. Moments later, Westbrook hit a 3-pointer to pull Oklahoma City within four at 118-114 with 1:44 remaining. Murray responded with a layup before Westbrook hit another 3-pointer to make it a three-point game. His driving layup with 28.9 seconds pulled the Thunder to within a point. Jokic made a pair of free throws with 5.6 seconds left, but George then hit a 3-pointer with 1.4 seconds left to tie it – the first in a game that the Nuggets had led by as many as 20 earlier in the game. The Nuggets ran up their second-highest first-half point total of the season in taking a 72-57 lead, with Murray scoring 18 of his points in that span, including four of his 3-pointers. Thunder: G Andre Roberson, who played collegiately at Colorado, will miss the rest of the season after undergoing surgery to repair a ruptured left patellar tendon. … The 72 first-half points by the Nuggets were the most by an opposing team this season. … G Terrance Ferguson, limited to just over 4 minutes of play, was slowed by a stomach illness. Nuggets: F Mason Plumlee missed a second straight game with a strained right calf. … The 40 first-quarter points represented a season high. … Denver lost its previous two games by a total of three points. Nuggets: host the defending NBA champion Golden State Warriors on Saturday night.